WASHINGTON – The U.S. Department of Transportation (DOT) today released its March 2019 Air Travel Consumer Report (ATCR) on marketing and reporting air carrier data compiled for the month of January 2019. The full consumer report and other aviation consumer matters of interest to the public can be found at http://www.transportation.gov/airconsumer. 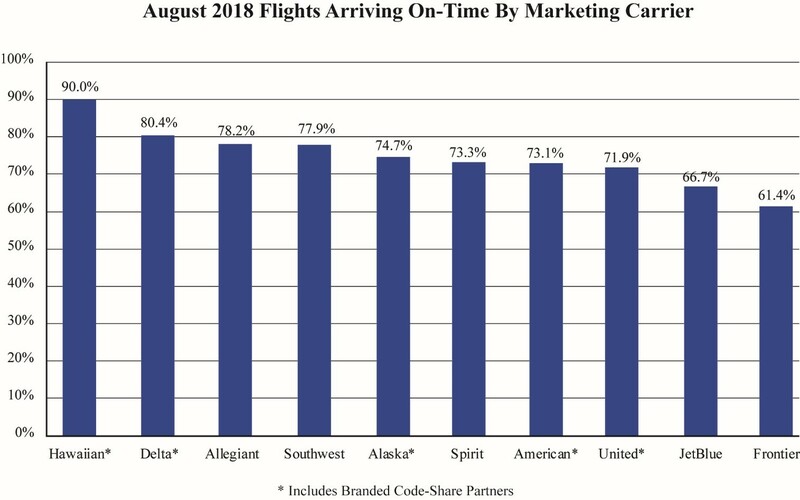 In January 2019, marketing carriers canceled 3.1 percent of their scheduled domestic flights, a higher rate than 1.2 percent in December 2018 and equal to 3.1 percent in January 2018. In January 2019, airlines reported 10 tarmac delays of more than three hours on domestic flights, a decrease from the 19 such tarmac delays reported in December 2018, and the 12 tarmac delays reported in January 2018. In January 2019, airlines reported four tarmac delays of more than four hours on international flights, compared to no tarmac delays reported in December 2018 and 32 tarmac delays reported in January 2018. Extended tarmac delays are investigated by the Department. Four of the domestic tarmac delays took place at Detroit on Jan. 22 and an additional four took place at the Washington-Baltimore airports that same day. Beginning in 2019, airlines with at least one-half of one percent of the total scheduled-service domestic passenger revenue for the 12-months ending December 2018 are required to report mishandled baggage data for domestic flights. Mishandled baggage data is to consist of the number of mishandled bags and the number of checked bags. Previous reports were the number of mishandled baggage reports and passenger enplanements. The Department has decided to delay the publication in the ATCR of the new mishandled baggage data in order to enable the Department and airlines to ensure the accuracy of the data, which will allow consumers to make informed choices. Inaccurate data is of little use to consumers. In May 2019, the Department plans to publish revised ATCRs for February 2019 (December 2018 data), March 2019 (January 2019 data), and April 2019 (February 2019 data) that include the new mishandled baggage data. In January 2019, marketing airlines reported checking 33,115 wheelchairs and scooters and mishandling 681, a rate of 2.06 percent mishandled. In December 2018, DOT reported mishandled wheelchairs and scooters data for operating carriers for the first time. These carriers reported 701 mishandlings which is a rate of 2.18 percent mishandled. See the March 2019 Air Travel Consumer Report for mishandled wheelchair and scooter numbers by airline. Bumping/oversales data, unlike other air carrier data, are reported quarterly rather than monthly. Fourth quarter 2018 bumping/oversales data were released in the February 2019 Air Travel Consumer Report. First quarter 2019 bumping/oversales data will be available in the May 2019 Air Travel Consumer Report. In January 2019, U.S. airlines reported one incident involving the death, injury, or loss of an animal while traveling by air, up from the zero reports filed in January 2018, but down from the two reports filed in December 2018. January’s incident involved the death of one animal. In January 2019, the Department received a total of 48 disability-related complaints, down from both the 66 complaints received in January 2018 and the 67 complaints received in December 2018. All complaints alleging discrimination on the basis of disability are investigated. In January 2019, the Department received seven complaints alleging discrimination – four regarding race, one regarding national origin, one regarding color, and one regarding religion. This is equal to the total of seven discrimination complaints reported in January 2018, but up from the three reported in December 2018. All complaints alleging discrimination are investigated to determine if there has been a violation(s) of the passenger’s civil rights.